Early on in with the Main Street Gazette I began a series called S.O.S., otherwise known as Save Our Swirl. The segment was a call to arms over places and things that had disappeared from Walt Disney World for no logical reason. The first installment lamented the loss of the Citrus Swirl as we knew it. At the time, the Citrus Swirl had become a concoction of vanilla soft serve and orange sherbet. I went so far as to say, and I stand by the statement, that the pale copy Citrus Swirl was decent, but even I would prefer a Dole Whip over this knock-off. If you know anything of the Citrus Swirl v. Dole Whip argument, you know how serious these words are. In a little time the Citrus Swirl’s memory was saved, as the lacking variation of the treat was removed from the menu of the Sunshine Tree Terrace entirely. This remained the status quo for a few years until the spring of 2012 when the Citrus Swirl made a quiet return to the Sunshine Tree Terrace. Little menu placards sat near the registers announcing the treat was available, but that was the whole fanfare it initially received. At the time, the pavilion was under refurbishment. Once completed later in the spring, this refurbishment would see the Little Orange Bird restored to prominence not only in this corner of Adventureland, but throughout the Magic Kingdom. So, what makes the Citrus Swirl so unique? The menu reads as follows, “Orange Slush with Vanilla Soft-Serve Ice Cream.” There isn’t much to gleam there, is it? The soft serve is the typical vanilla ice cream found all around Walt Disney World, from poolside at the resorts to specialty treats in the parks. The orange slush is actually a frozen orange juice concentrate. When paired together you get would think you’d get a creamsicle type flavor, but it carries a much stronger orange citrus flavor, with the creamy, vanilla ice cream serving as almost a palate cleanser between bites. The rub with a Citrus Swirl, particularly as it is served in Florida, is that it does not have a long shelf life. That is to say that it melts, in fact it begins to melt almost immediately. Which means you cannot sit down and savor every bite of the Citrus Swirl slowly. You can savor every bite, but those bites had best come in rapid succession! I grew up in the orange groves and strawberry patches of Florida, when the Little Orange Bird may have been faded, but he was still painted on fencing and roadside souvenir/travel stops. With the Citrus Swirl, there was a ridiculously delicious ice cream indulgence that highlighted one of my home’s best natural resources. For this Floridian, and I’m sure a great many others, the Citrus Swirl carried a sense of pride with it. With its return, the Citrus Swirl not only gives Floridians back something to crow about, but also adds another distinguishing palate pleaser to Adventureland, and also continues to highlight the what’s old is new mentality hanging around Walt Disney World. Oh, and if you need any further persuasion to try the Citrus Swirl, here is my review: It’s delicious. It’s delicious! IT’S DELICIOUS! Thanks for this post. Here's a question from one who's heard nothing but great things about the Dole Whip but has only ever had a Dole Whip Float. Now this Swirl is back and I'm hearing all things good about it. So...which one would you ultimately recommend? I only get to WDW once every year or two so like to make the most of my time and food choices when I'm there. You're one of my favorite WDW Radio guests and I enjoy your blog. Thanks. Glenn, I'm maybe not the most unbiased of opinions here, but I prefer the Citrus Swirl hands down. I find the Dole Whip to be a bit too sweet, while the Citrus Swirl has a nice balance of those strong citrus flavors and the sweet of the ice cream. I'm glad you enjoy my visits to WDW Radio, they are always a blast to record! Just wondering--I was reading this post over at DFB-- http://www.disneyfoodblog.com/2012/12/31/disney-dining-classic-dole-whip-float-at-magic-kingdoms-aloha-isle/#more-72722-and noticed nothing called "Citrus Swirl" on the menu pic. 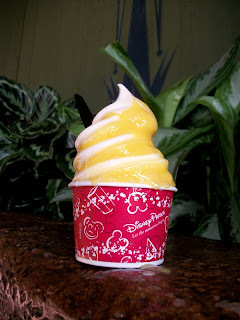 Is it called Dole Whip soft-serve swirl on the menu? I just had one and much prefer the citrus over the dole whip! I prefer the tart/sweet smooth icy texture rather than the texture of soft serve - and i think the flavour is accentuated in the slush. I ate mine using surgical precision to avoid the vanilla soft serve. Glenn - The citrus swirl is not served at Aloha Isle with the Dole Whip. Keep walking past Aladdin to the side of Tiki Birds to the Sunshine Terrace.